The Eclipse 550, the new production twin-engine jet from Eclipse Aerospace, features best in class performance, economics, and safety. 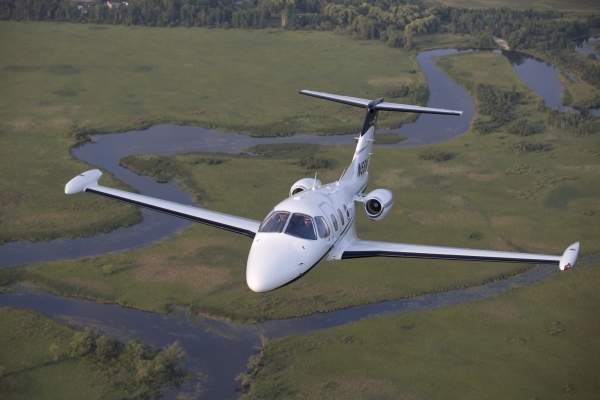 With the ability to fly at altitudes up to 41,000 feet at a max cruise of 430 mph, all while consuming less than 200 litres (400 lbs) of fuel per hour, the Eclipse 550 is the most efficient twin-engine jet on the planet. The plain fact that this capability is available in an aircraft that is hundreds of thousands of dollars less expensive than its nearest competitor, and that its operating costs are 35% lower than its nearest competitor, is no small feat. 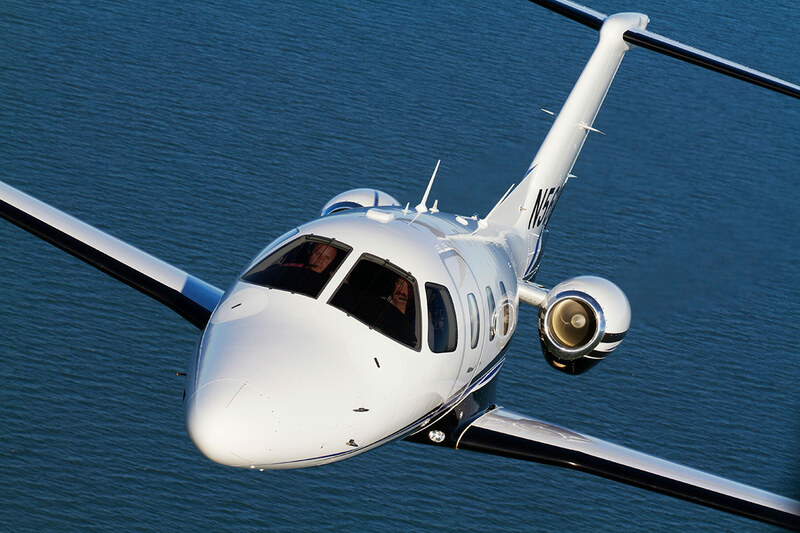 The Eclipse 550 delivers everything you need to fly in comfort and in style. With ergonomically designed interior appointments constructed from the finest materials available, you will be free to work or rest, play or dream. Enjoy the quiet of your flight; talk to your companions without having to raise your voice above the screaming engines. Relax. 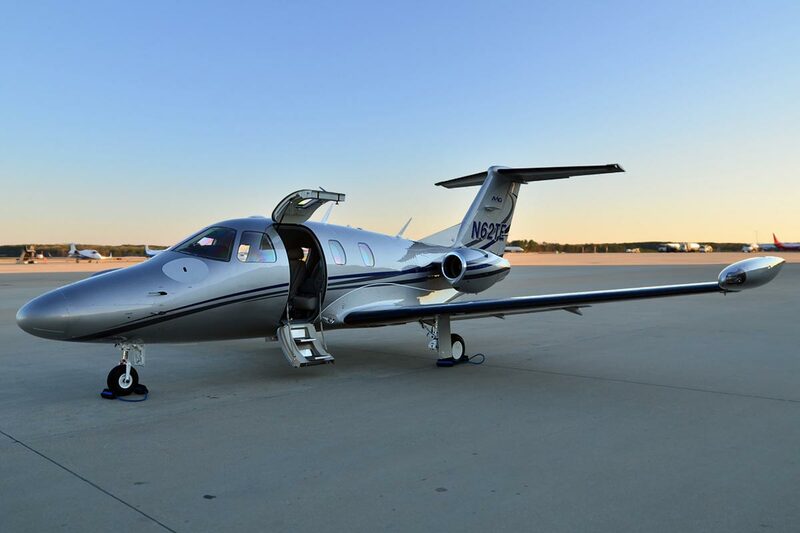 The Eclipse 550 is perfectly suited for your journey, wherever it may take you. The Eclipse Jet is the world’s most economical twin-engine jet, costing less to acquire and less to operate than any other twin-engine jet on the planet. The direct operating cost of an Eclipse Jet is $2.02 per nautical mile, 35% less than our nearest jet competitor, and comparable to many high-performance turboprop aircraft. Take a look at the standard and available feature options on the Eclipse 550. The Dual Avio Integrated Flight Management system (IFMS) on the Eclipse 550 is an incredibly advanced system whose purpose is simple: making piloting the Eclipse jet safe and easy. By reducing the number of switches and dials in the cockpit and creating an easy to use Synoptic page for each aircraft system, the design team at Eclipse has simplified the act of flying by producing pilot controls that are more intuitive. 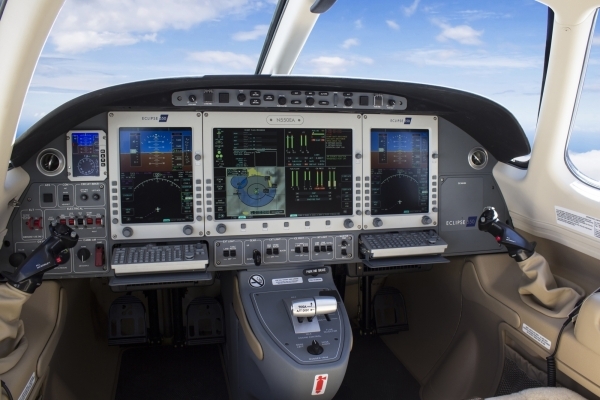 The avionics system in the Eclipse 550, designed to be completely integrated, gives the pilot the ability to move between graphical systems interfaces quickly, removing unneccessary data and allowing the pilot to focus on the task at hand. Each synoptic page is displayed on the large, high resolution, multi function display (MFD), providng the pilot a complete picture of the operations and performance of that system, all in one location. At One Aviation we take particular pride in the safety record of our fleet. We designed the Eclipse jet to be flown single pilot, adding safety features that other light jets can only dream about – features that heightoen awareness of weather, traffic and other obstacles in Flight. We have streamlined control of the Eclipse jet to make piloting your own jet a less formidable task. Simply put: we built the Eclipse 550 to be safe and easy to fly. The Eclipse jet has significantly more payload than the Citation Mustang and Embraer Phenom 100 with 636lb of available payload with Max Fuel compared to 590 and 580 respectively. The total range is 1,125nm, with a burn rate of 48-59 gal/hr at the direct operating cost of $741.19 /hr. The range map from London (left), indicating effectively a three hour range so the perfect jet for european needs. Eclipse has always kept its eyes on the environmental impact of our aircraft. In fact, we’ve revolutionised two aspects of aviation: fire suppression systems and methods of construction. Our fire suppression system, PhostrEx, is the first non-Halon system approved by the FAA and EPA alike. Friction Stir Welding, a method of airframe construction first implemented by Eclipse, is a smoke-free method of bonding that is ten times faster than manual riveting, and yields a much stronger and lighter end product. This method of construction, combined with the revolutionary Pratt & Whitney 610F engines, make the EClipse the most fuel-efficient twin-engine jet on the planet. The Eclipse 550 will now come standard with a comprehensive 5-year Aircraft Warranty and a 5-year Eclipse Advantage maintenance program. The Eclipse Advantage program covers the cost of all scheduled maintenance inspections on an Eclipse Jet for the first 5 years or 1,000 flight hours. These exciting changes are the first of many that ONE aviation will be revealing over the next several months to demonstrate their customer focus and continuing commitment to producing the most innovative and affordable aviation products on the market today. “The Eclipse 550 is already the highest, fastest, most technologically advanced, low-cost jet currently on the market. To further distinguish the 550, we created the Eclipse Advantage program to remove any uncertainty or fear about the actual cost to own and operate a new Eclipse. The program simplifies aircraft ownership and provides clarity, convenience, and peace of mind for our customers,” stated Alan Klapmeier, ONE Aviation CEO. “With the reliability of the 550 now being established, we felt that the time was right to increase company support, and make the costs of aircraft ownership more transparent and predictable. Eclipse Advantage does just that, by covering all scheduled inspections for the first 5 years. This program, combined with a full 5-year warranty on parts and labor, clearly communicates to our customers that ONE Aviation stands behind its products,” continued Klapmeier. 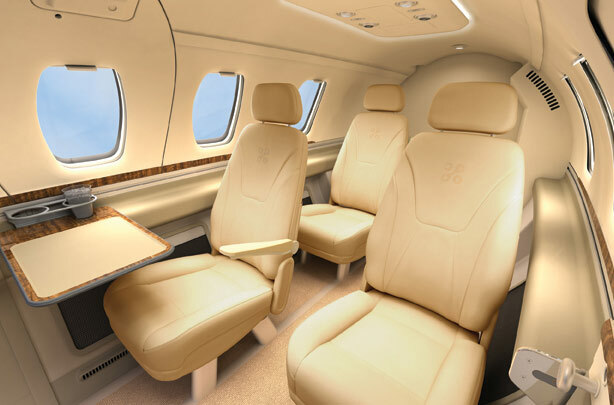 Why take the risk of flying in a more expensive single engine turboprop like a Pilatus PC-12 or Socata TBM 850 which can only fly slower and lower (making them more susceptible to weather conditions), when you can have the safety and quiet comfort of 2 jet engines for less money. The majority of pilot / owners fly the aircraft as a single pilot, having complete confidence in the capabilities of the Avio system to act as their virtual copilot. The Eclipse avionics system features a redundant Integrated Flight Management System, Class 3 E-charts, FADEC engine control, and XM Satellite Weather. The high resolution MFD / PFD displays control all of the major aircraft systems. Dual WAAS / SBAS beta-3 GPS receivers from IS&S are utilized for precise navigation. With enhanced situational awareness, electronic charts and maps, display and control of the aircraft systems, and the integrated autopilot control panel, the pilot is provided with the most advanced Flight Management System available in a light jet. Stop in as Little as 700 feet! The electronically activated Anti-Skid Brake system in the Eclipse 550 allows for maximum braking energy and skid control. Testing has shown the Anti-Skid Braking system to stop an aircraft at normal landing speeds (approximately 70 knots) in approximately 700 feet. Couple the throttles to the auto flight system, selecting the appropriate airspeed for the autothrottle system to maintain, and servos in the throttles will physically adjust the thrust lever angle to the appropriate power setting. With the Eclipse 550 Auto Throttle, the pilot may couple the throttles to the auto flight system to control the aircraft’s speed. The pilot will select the appropriate airspeed for the auto throttle system to maintain, and servos in the throttles will physically adjust the thrust lever angle to the appropriate power setting. This feature will greatly reduce the pilot’s workload. Create a 3D picture of your flying environment, showing a clear map of the terrain, routing, desired flight path, and obtain a visual on the runway. Where rising terrain may pose a hazard, potential flight-into terrain risks will be color coded for easy recognition. The Eclipse 550’s Enhanced Vision System uses forward looking infrared technology to allow pilots to see when visibility is limited by weather. This greatly enhances the pilot’s ability to navigate at night or in low IFR conditions. The Enhanced Vision System displays on the 550’s 15 inch Multi-Function Display. Every Eclipse Jet comes with the ability to fly into known icing conditions. The 550’s pneumatic de-icing boots will remove ice buildup from the wings as you move through the weather on the way to your destination. The Pratt & Whitney PW610F turbofan engine, specially designed for point-to-point travel in a new generation of light and very light jets, offers outstanding performance together with PWC’s trademark dependability. Compact and lightweight, the PW610F is built with a simplified design that uses fewer parts than a conventional turbofan, making it easy and economical to maintain.Capable of delivering 900 pounds of take-off thrust, the PW610F incorporates the latest technology to deliver highly fuel-efficient power with low carbon emissions. It also comes equipped with dual-channel full-authority digital engine control (FADEC) which translates into reduced pilot workload. 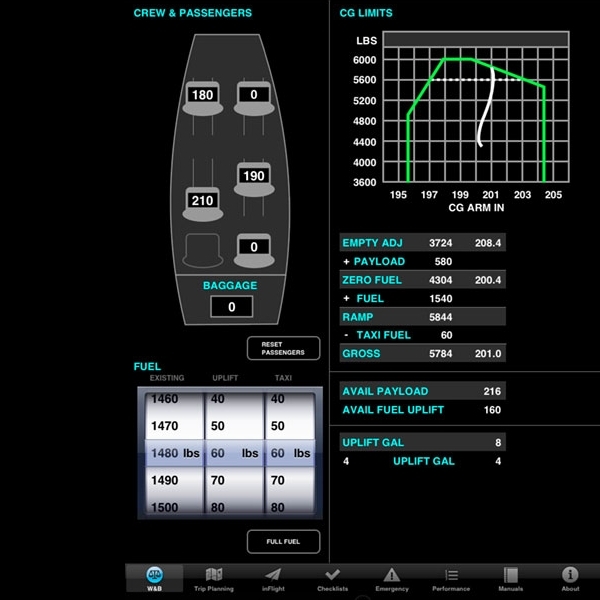 The Eclipse Quick Reference Application (Eclipse QRA) for the Apple iPad®, available exclusively for owners / operators of the Eclipse Twin-Engine Jet, provides pilots with the ability to use an iPad as a unique flight-planning tool and for inflight reference documentation. The Eclipse QRA includes a weight and balance flight planning tool, interactive flight checklists, and performance planning tools. In addition, the Eclipse QRA is capable of providing digital copies of the Aircraft Flight Manual (AFM) and the Aircraft Maintenance Manual (AMM), complete with updated downloads of Temporary Revisions and other pertinent customer communications. Eclipse Aerospace, with a commitment to maintaining the most technologically advanced jet aircraft in general aviation, continues to deliver critical features that are unavailable from other aircraft manufacturers. No other aircraft manufacturer has fully integrated an application to allow pilots to plan all phases of flight. Using the Eclipse QRA’s highly intuitive graphical interface, pilots can quickly and accurately calculate their mission. The data can be saved for future use, or for when things change at the last minute. Extra luggage or additional passengers are easily updated within the app to adjust calculations on the fly. The data can also be emailed directly out of the app to the pilot, dispatcher, or other relevant party. As the pilot begins their planning, the Eclipse QRA walks them through critical aspects of their mission: Weight and Balance, Fuel Planning, and Performance (Takeoff, Cruise, and Landing). It provides full checklist and Quick Reference Handbook (QRH) functionality, allowing pilots to work their way through all checklists with easy to track completion reminders.